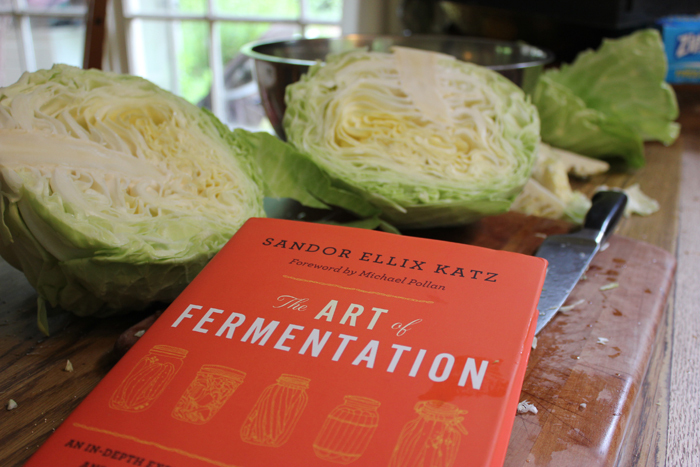 We have been inspired for years by “fermentation revivalist” Sandor Ellix Katz, the author of Wild Fermentation, The Revolution Will Not Be Microwaved, and most recently, The Art of Fermentation. Way back in 2000, my husband came across a small fermentation zine written by Sandor. That zine launched Brian into full-scale fermentation mode for a number of years. I can’t even count the number of strange fermented foods that resided in my fridge and on my table for a time. 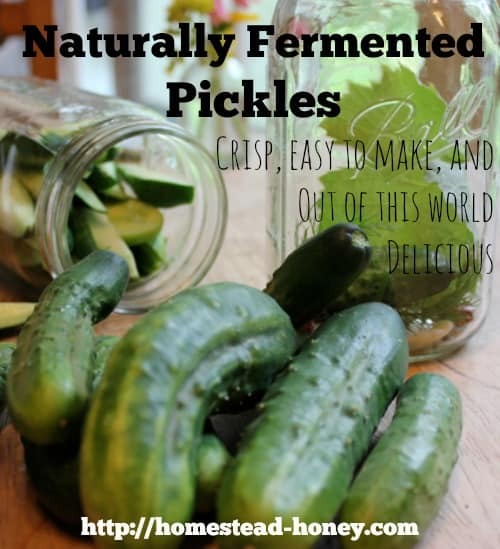 While we have not continued to ferment with such wild abandon, there are a number of fermented foods that continue to play a regular part in our lives: sourdough bread, homemade wine, goat cheeses, salami, sauerkraut, and pickles. 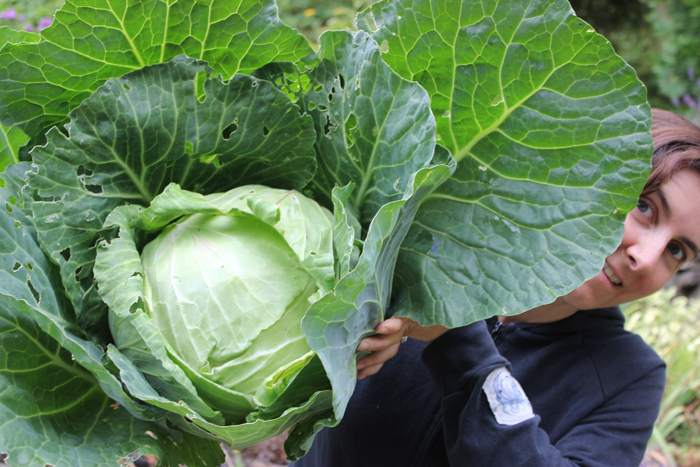 When you grow cabbages as big as this one, what can you possibly do but turn them into delicious and nutritious sauerkraut? 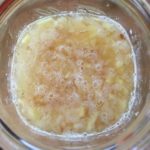 Naturally fermented, or lacto-fermented sauerkraut is one of the simplest fermented foods you can make. By packing cabbage and sea salt into a crock and letting it ferment naturally, you can preserve your homegrown vegetables, retaining vitamins, minerals, and enzymes in the process. 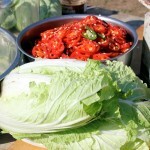 Naturally fermented sauerkraut is a living, raw food, laden with probiotics, so it is great for your digestive system. Plus it tastes amazing. Seriously – it’s the best sauerkraut you will ever eat. 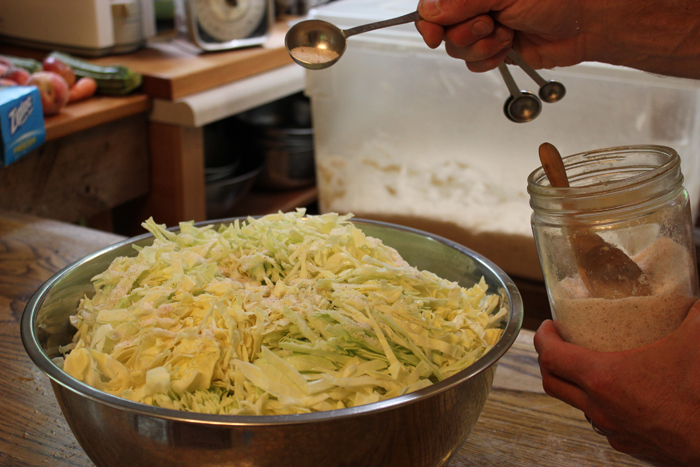 The essence of the recipe is this: slice up some cabbage; for every 5 lbs of sliced cabbage, sprinkle 3 tbsp. of salt over the top. Mix it up, pack it tightly in a glass jar or ceramic crock, and let the wild fermentation begin! 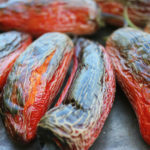 If you’d like to follow a more detailed plan, the Wild Fermentation website has a great recipe. After living with my fermentation-obsessed husband for many years, I have picked up some fermenting skills of my own, and I’m proud to say that I am the resident pickle maker in this home. I love creating new blends of spice and flavor for each batch. This particular blend includes black peppercorns, lots of garlic (about 3 cloves per quart jar), coriander, dried red hot peppers, some fresh dill, and a grape leaf to keep things crisp). If I have smaller cucumbers, I like to keep them whole in the jars. But you can also cut them into spears, or bread-and-butter style. Simply add your garlic and spices to the jar, arrange the cucumbers, and cover completely with brine. The brine is the essential part, so you do need to get this part right: to make one gallon of brine, dissolve 3/4 cup of salt in one gallon of water. I like to leave my pickles on the counter, with a lid slightly ajar. 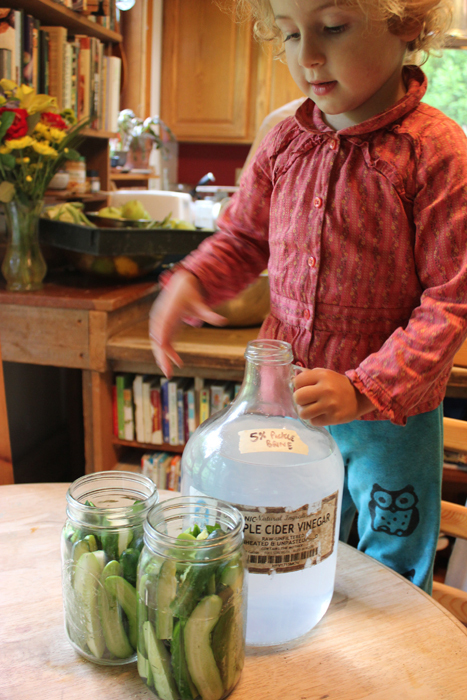 Each day I tighten the lid, turn the jar over to make sure all of the cukes are moistened with the salt brine, and then return them back to their original position. 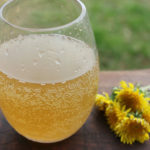 After a few days, you will begin to see small fizzy bubbles form in the jar, as fermentation begins. After a week or so, I sample a pickle to see if it’s reached my desired level of sour flavor, then pop the jars in the fridge for storage. They will keep for months, but trust me, they will not last that long! If you’d like to learn more about lactic-acid fermentation, I highly recommend Sandor’s books Wild Fermentation and The Art of Fermentation. And do listen to him on NPR’s Fresh Air (part one and part two), as he is as articulate and inspiring as someone can possibly be about a pickle. Now go on and ferment! Try the same thing, but add dill! But these you will need to keep in the fridge. Do the pickles remain crisp? Thank You for the inspiration to try the fermentation process. I can a lot but I have never tried this approach to pickles. Yes, they will stay crisp if you put them in the fridge a little but BEFORE you think they are ready. They will continue to ferment a bit in the fridge. Also, grape leaves are said to help with crispness. Do you need to refrigerate the sauerkraut too? And/or sterilize the jars first? Yes, when your sauerkraut is pretty close to your desired sourness, transfer it, and keep it in the fridge. It will keep for months. I never sterilize the jars for kraut, but if you’re planning to can something, you should. LOVE LOVE LOVE all these pics! Especially you holding a huge cabbage. Fermentation is something we really want to get into this year. Thx for the info! Thanks! My husband is really the fermentation guru of our family. I make pretty awesome pickles though! That cabbage was the crowning glory of my cabbage career. Here in MO, it is so hard to grow them because of Cabbage Moths. 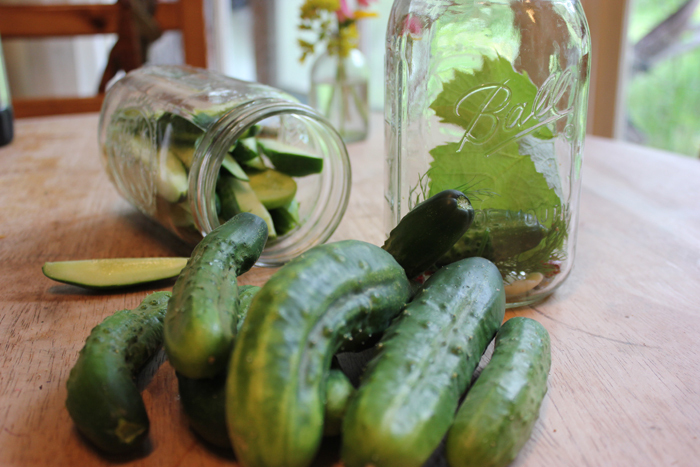 Lacto-fermented pickles are the ONLY way to go. Once you’ve had really good ones, like Bubbies, you can’t go back am I right?! Yes, it is so yummy! I just found your website, and I LOVE it! We just bought a small farm in February and this is our first legit garden. We have already gathered our cabbage and it is fermenting away in a churn that belonged to my great-grandmother as I type. 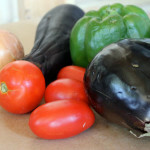 We have an abundance of zucchini and yellow squash as well, and I’m looking for a wild fermentation style recipe for a sweet(ish) relish, preferably using honey, maple syrup, or other natural sweetener like that. 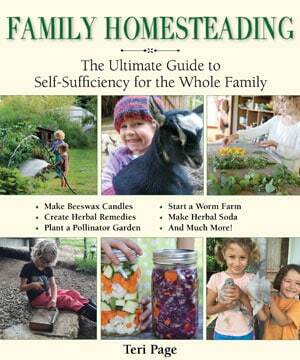 Do you have any ideas or recommendations for wild fermenting with sugars, in general? Thanks so much! Thank you April! Glad to have you here! I have not yet made a lacto-fermented sweet relish, but you might try the website Punk Domestics. 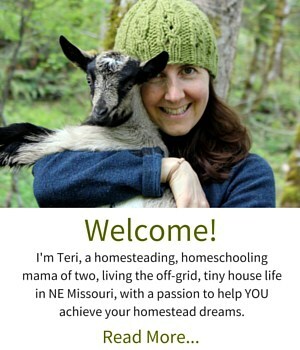 They have so many wonderful resources for fermentation!